World travel health alerts for 6th of February 2019. 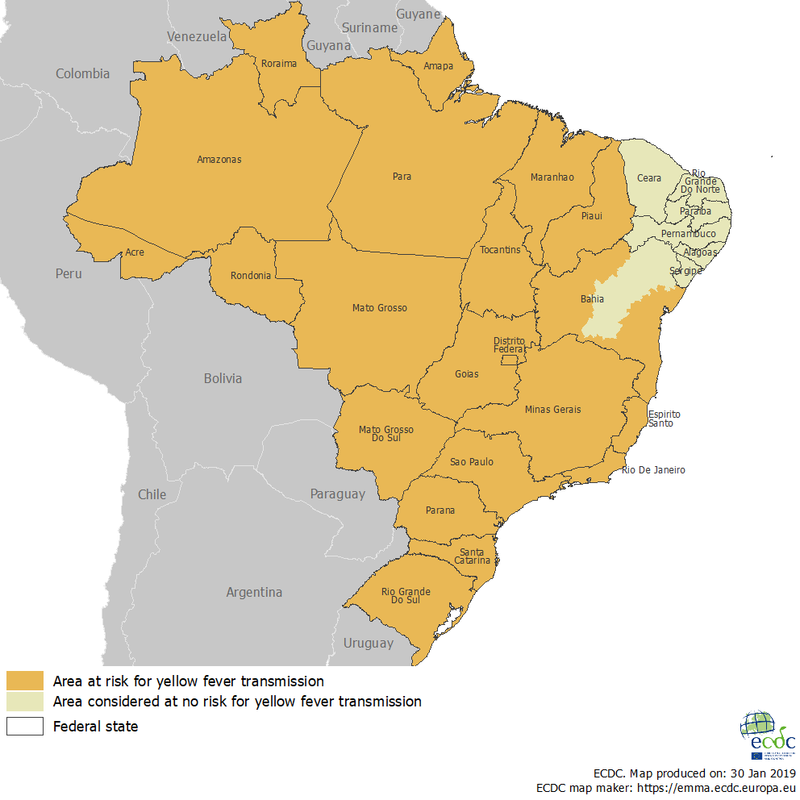 On Jan 31, the ECDC published its updated map on Brazil’s yellow fever risk areas which is based on the WHO’s 2018 Yellow Fever Vaccination Recommendations in the Americas. It is mid-flu season with reports 23 states and New York City were experiencing high rates of influenza-like illnesses (ILI) up to the end of week 4 and a further 10 states and Puerto Rico reported moderate ILI rates. According to the CDC’s FluView, ‘the majority of influenza viruses characterized antigenically and genetically are similar to the cell-grown reference viruses representing the 2018–2019 Northern Hemisphere influenza vaccine viruses’. Influenza A viruses predominate. In Canada, the influenza vaccine has been 72% effective this season against the predominant circulating virus, influenza A(H1N1)pdm09, offering “substantial” protection, researchers said. See more at healio.com. Influenza reporting in Japan has spiked with record numbers of flu diagnoses – more than 7.6 million cases this season. As with North America, influenza A viruses are most common. WASHINGTON State health department is now reporting 49 confirmed measles cases and a further 11 are probable - at least 42 of the confirmed cases were unimmunised. Read more. On the east coast, Rockland County’s reported measles cases have risen to 130 since October while in Brooklyn, 64 cases have emerged among the Orthodox Jewish community living in four neighbourhoods. This local outbreak began after several unvaccinated children returning from Israel and the virus then spread locally. The latest WHO External Situation Report, published yesterday, provided details on 12 of the 18 affected health zones in the provinces of North Kivu and Ituri which continue to report ongoing active Ebola virus transmission. The Health Ministry’s daily newsletter puts the case count as of Feb 5 at 788 cases (734 confirmed and 54 probable), 191 suspected cases under investigation and the locations of three new confirmed cases - Katwa, Kyondo and Oicha. Read the update here. Lassa fever is a low risk for most travellers. Rodents shed the virus in urine and droppings and it’s then passed on to humans through direct contact, touching objects or eating food contaminated with these materials, or through cuts or sores. While Lassa fever is mild or has no observable symptoms in about 80% of people infected with the virus, the remaining 20% have a severe multisystem disease. Read more on Lassa fever. Of the 707 dengue fever cases reported since September last year ((99% were DENV2), 435 were recorded over January and almost half of those in the capital Noumea - an epidemic alert was declared by the DASS on Dec 21, 2018. The neighbourhoods of Rivière Salée and Vallée des Colons have been hardest hit. Read more. And in an update of Palau’s dengue outbreak: from Dec 1 to Feb 3 there were 77 cases – the southern state of Koror recorded 75 percent of all cases. Two batches of falsified rabies vaccine (Verorab®) have been found to be in circulation, leading to notification of the WHO and its subsequent release of Medical Product Alert N° 1/2019. A falsified medical product is one that ‘deliberately/fraudulently misrepresents their identity/composition/source. The WHO-approved cell culture vaccine is used for both pre- and post-exposure vaccinations to prevent rabies, an infection that kills between 200 and 300 Filipinos every year. The Philippines is in the top 10 of rabies incidence countries worldwide. A viral infection, tick-borne encephalitis (TBE) can cause fever, vomiting, cramps and paralysis, which can be prolonged. In rare instances, infection can be fatal. Travellers who spend time in regions where TBE is endemic – mainly forested areas of Central and Eastern Europe, Russia, Northern China, and Mongolia – may be at risk. The highest risk is during the warmer months from April to November, especially when hiking or camping in areas below 1500m. While safe and effective vaccines are available in Europe, none are licensed in Australia. However, vaccination can be obtained by doctors through a Special Access Scheme.